Fifteen Kiwi restaurants (including Amano pictured above) feature in Truth, Love & Clean Cutlery, a new guide to the “truly good restaurants and food experiences of the world”. 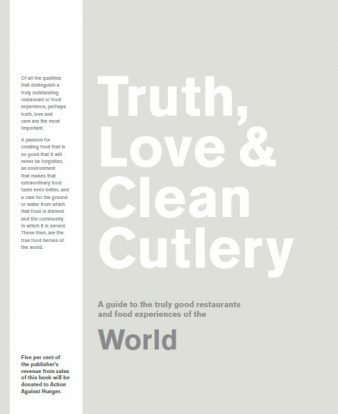 Truth, Love & Clean Cutlery, a new guide to the “truly good restaurants and food experiences of the world” has been created in collaboration with over fifty of the world’s leading food writer and has been initially launched online at www.truthloveandcleancutlery.com. The guide aims to identify restaurants and food experiences that go above and beyond exceptional food in the ethical and sustainable ways with which they run their business. This digital platform will be followed by the publication of four Truth, Love & Clean Cutlery guidebooks on 1 November 2018. The guidebook includes restaurants from forty-five countries and features fifteen New Zealand restaurants. Auckland favourites Orphans Kitchen, Pasture and Amano, to Queenstown’s Sherwood and Wellington’s Hillside Kitchen, are among the 1250 restaurants selected from around the world. The guidebooks have been created by award-winning New Zealand publisher Blackwell & Ruth, who were the originating publishers of the Great Cookbook series in Australia, New Zealand, South Africa, USA and UK, which has raised over $1 million for food security organisations. They also delivered 2017’s acclaimed book 200 Women: Who will change the way you see the world. They are proud to have local food heroes feature in this important and timely series. “Of all the qualities that distinguish a truly outstanding restaurant or food experience, perhaps truth, love and care are the most important”, say project creators, Geoff Blackwell and Ruth Hobday. “Those qualities reflect a passion for creating food that is so good that it will never be forgotten, an environment that makes that extraordinary food taste even better, and a care for the ground or water from which that food is derived and the community in which it is served.